Are you familiar with Runes? They are a Scandinavian oracle that can give us answers for questions about our life. To consult this oracle, you need to know a little bit of interpretation of Runes. In this article, we will teach you how to do it. Runes (also called as Futhark) are an alphabet composed of 24 letters (or symbols) used by the ancient Scandinavians, such as in Norway, Finland, Sweden, Denmark and Iceland. Those people used to engrave the symbols on individual stones (or clay and pieces of wood) to improve the communication between them. Runes were a way to communicate on Earth but also with the Divine. Those letters carried a mystical energy, creating a type of guessing game. Shamans and other spiritual leaders considered runes as talismans, since they also had the capacity to attract power and prosperity. The essence of the Runes was always intimately close to nature since the beginning. This means that the letters should always be engraved on materials coming from nature. You could never use plastic or other synthetic materials to create your Runes in an efficient way. You can choose the material that fits best for you and how to engrave it. You can choose to paint, to carve or even use fire. All the process of engraving your own Runes already brings you closer to nature and the lesson it has to teach you. You should always keep your Runes together in a fabric bag. It is better if you make your own bag but if it is not possible, you can buy one. Note that the fabric should have only one color and it needs to be made of natural materials such as cotton and linen. After you made your Runes, put the bag under your pillow and sleep during one week like this to activate the Runes. This will create a connection between theirs and your own energy. The dreams you have will help to reinforce your intuition. 1. Choose a quiet time to cast. 2. Close your eyes briefly and listen to your breath, relaxing all your body. 3. Concentrate on the questions you want to clarify. 4. There are some different ways to cast the Runes and here we will teach you two. Shake the bag with the Runes thinking of a situation that might have been disturbing you. Ask for an advice and take one rune from the bag. Give thanks for the advice and look for the meaning of that rune. Then, take three runes from the bag, one at a time. Put them in a line from the left to right. The first rune will be more relevant, the second one will have some kind of influence and the third one will add a little detail. Runes are a very objective oracle and they will never talk through a metaphor. Pay a lot of attention on the meaning of the runes to get a conclusion. They can represent positive or negative aspects. To know that, just look if they are upside down when you take them from the bag. If they look normal, it is a positive aspect while being upside down means it is negative. 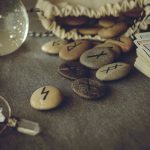 Meanings of the Runes: what are they trying to tell you?